New research may bridge the gap between two ideas about the climate of ancient Mars—the “warm and wet” story of Martian geology and the “cold and icy” past of atmospheric models. Scientists have long tried to understand what ancient Mars might have been like, but the red planet has offered some mixed signals. Water-carved valleys and lakebeds leave little doubt that water once flowed on the surface. But climate models for early Mars suggest average temperatures around the globe stayed well below freezing. The new study shows that it’s plausible, even if Mars was generally frozen over, that peak daily temperatures in summer might sneak above freezing just enough to cause melting at the edges of glaciers. That meltwater, produced in relatively small amounts year after year, could have been enough to carve the features observed on the planet today, the researchers conclude. Ashley Palumbo, a PhD student at Brown University who led the work, says climate dynamics found here on Earth inspired the research. The researchers started with a state-of-the-art climate model for Mars—one that assumes an ancient atmosphere composed largely of carbon dioxide (as it is today). The model generally produces a cold and icy early Mars, partly because the sun’s energy output is thought to have been much weaker early in solar system history. The researchers ran the model for a broad parameter space for variables that may have been important around 4 billion years ago when the iconic valley networks on the planet’s southern highlands were formed. 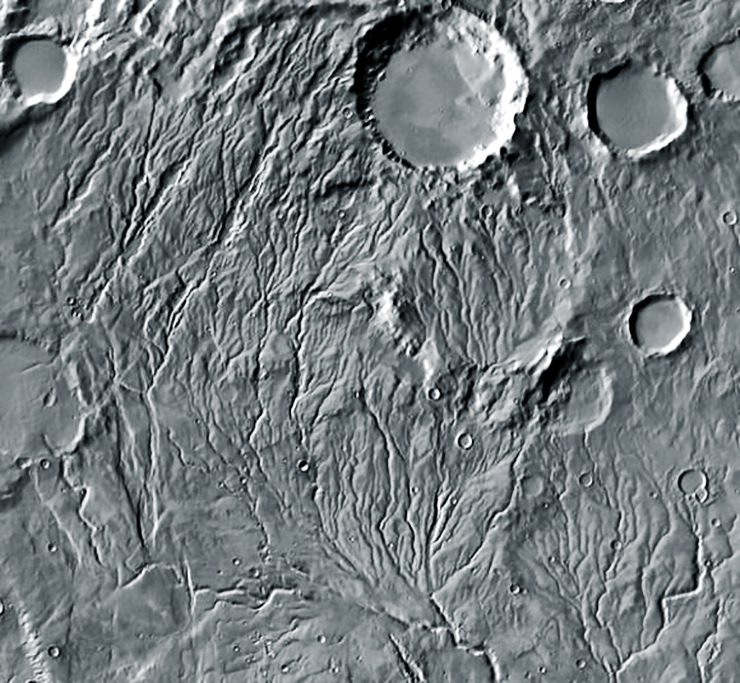 Did hot impact melt ice to make valleys on Mars? It’s also not known exactly what the variations in Mars’ orbit might have been like 4 billion years ago, so the researchers tested a range of plausible orbital scenarios. They tested different degrees of axis tilt, which influences how much sunlight the planet’s upper and lower latitudes receive, as well as different degrees of eccentricity—the extent to which the planet’s orbit around the sun deviates from a circle, which can amplify seasonal temperature changes. In order for this mechanism to possibly explain the valley networks, it must produce the correct volume of water in the time duration of valley network formation, and the water must run off on the surface at rates comparable to those required for valley network incision. A few years ago, Jim Head, a professor in the earth, environmental, and planetary science department, and Eliot Rosenberg, an undergraduate at the time who has since graduated, published an estimate of the minimum amount of water required to carve the largest of the valleys. Using that as a guide, along with estimates of necessary runoff rates and the duration of valley network formation from other studies, Palumbo showed that model runs in which the Martian orbit was highly eccentric did indeed meet these criteria. That degree of eccentricity required is well within the range of possible orbits for Mars 4 billion years ago, Palumbo says. The researchers report their findings in the journal Icarus. Robin Wordsworth, a professor in Harvard University’s School of Engineering and Applied Sciences, is also a coauthor of the paper.